We have briefly stepped away from our entry level instrument theme with this instrument. 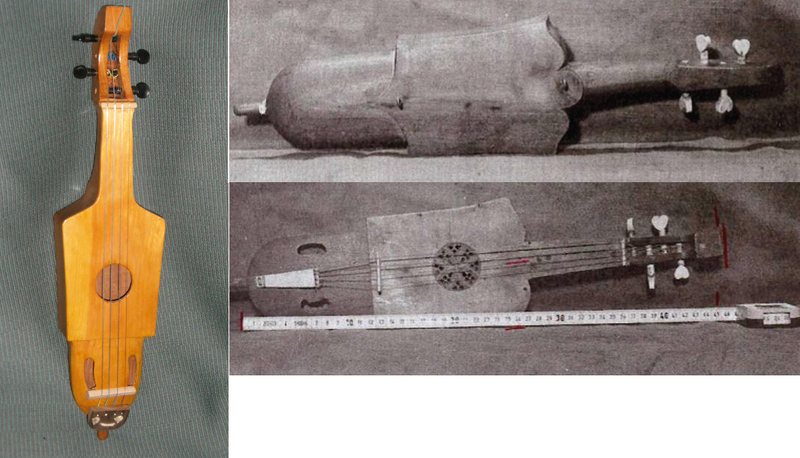 Based on a number of 15th C sources, this fiddle is probably best played on the leg. It has a very thick solid cherry body with a fine grained spruce soundboard, maple bridge, walnut tailpiece, maple fingerboard, boxwood nut and Sensicore viola da gamba strings . The scale length is 16″ and it has tied on frets. It has a beautiful warm tone and excellent resonance. It comes with a medieval bow and a custom fitted hard case. It is available for immediate shipping. These top two examples are a step away from our usual entry level instruments. 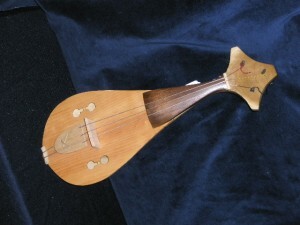 Based on 13th and 14th C examples, this viol has a very low bourdon string. It has a solid maple body with a high grade spruce soundboard, maple tailpiece and bridge,walnut fingerboard, boxwood nut and 4 strings from a Sensicore Treble Viola da Gamba set with a 1/4 cello bass string for the bourdon. It has excellent resonance and volume. The scale length is 16.5″ and it comes with a medieval bow and a custom fitted hard case. It is available for immediate shipping. 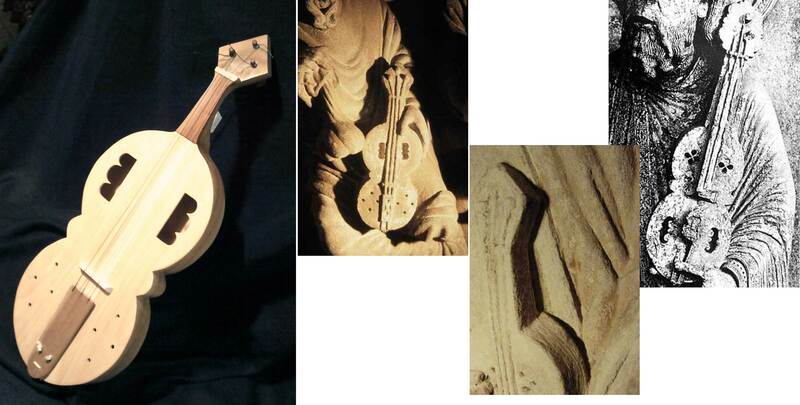 Based on a number of 13th and 14th C examples, this viol is made from a thick piece of walnut and has a nice sound. It has a spruce soundboard, walnut tailpiece, maple bridge, maple fingerboard, boxwood nut and nylon treble viola da gamba strings. I find it more comfortable to play gamba style, but it can be played up as well. 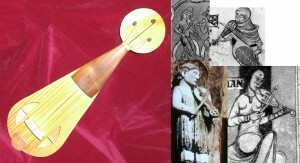 A medieval bow and case are available at additional cost. Available for immediate shipping. Based on a 15th C piece, this 5 string viol has a solid cherry body with a fine spruce soundboard, white oak tailpiece, maple bridge, figured maple fingerboard, boxwood nut, tied on nylon frets and a hand rubbed French polish finish. It has a 15″ scale length and is currently strung with a set of nylon viola strings and a nylon high D string from a treble viola da gamba. It could just as easily be string using 5 of the 6 strings from a treble set. This instrument does not include a bow, but a medieval bow is available at additional cost. Available for immediate shipping. Based on one of the fiddles found on the Mary Rose, Henry VII’s warship which sank in 1545. Probably built by one of the sailors, it shares construction details with earlier instruments. This instrument is probably much nicer than anything found on a warship of the time, but it looks quite nice. It has a solid cherry body with a spruce soundboard, walnut tailpiece, maple bridge, maple fingerboard and a boxwood nut. It has a fine French polish finish and good quality viola strings. It has a viola scale length with a raised curved bridge and great resonance. There is no bow included with the is instrument, though, either a medieval style bow or a bow based on the one found on the Mary Rose are both available at additional cost. It is available for immediate shipping. Based on a 14th C illumination, this fiddle has a fine figured maple body with a fine spruce soundboard, white oak tailpiece, maple bridge, cherry fingerboard, and a boxwood nut. It has a hand rubbed French polish finish and high quality nylon core violin strings. The maple body has good resonance. This instrument has a smooth and easy action and therefore is not suitable for having frets added. There is not a bow included with this instrument, though a medieval bow is available at additional cost. It available for immediate shipping. Another fiddle based on the above illumination, this one has a solid cherry body with a fine spruce soundboard, cherry tailpiece, maple bridge figured maple fingerboard, boxwood nut and modern violin strings. It has a hand rubbed French polish finish. There is not a bow included with this instrument, though a medieval bow is available at additional cost. It is available for immediate shipping. Here is a budget fiddle based on the above illumination. It has a solid poplar body with a spruce soundboard, white oak tailpiece, maple bridge, walnut fingerboard, boxwood nut, modern violin strings and tied on nylon frets. The bridge on this instrument is fairly low with a shallow curve. Available for immediate shipping. 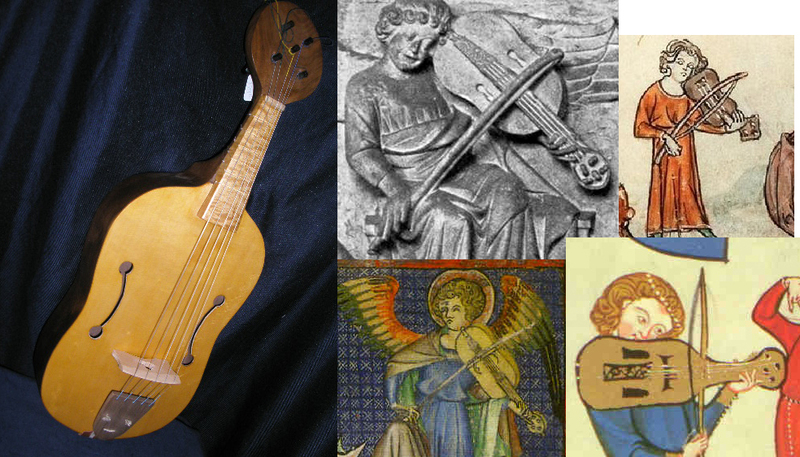 Based on one of the few existing medieval stringed instruments, this is attributed to St. Catherine de Vigri from the 15th Century. It has a solid cherry body with a 2 piece spruce soundboard, walnut tailpiece, maple bridge, boxwood nut and violin strings. It is quite a small and relatively quiet instrument, but has nice tone. It has fine French polished finish and is available for immediate shipping. No bow is included, but a medieval bow is available at additional cost. 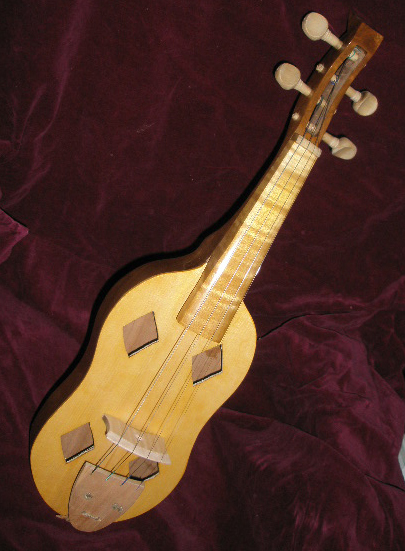 Based on a number of 14th and 15th C examples this viol has a solid poplar body with a spruce soundboard, white oak tailpiece, maple bridge, walnut fingerboard, boxwood nut and modern viola strings. It has a big voice and good tone. It comes with a modern bow, but a medieval bow is available at additional cost. Available for immediate shipping. Based on a number of different iconographic examples, the bowed vihuela dates from the mid to late 15th C. It was either played up as in the picture above, or across the body, though many that have been sold are played gamba style. A strap has been included to address this. The instrument has a solid poplar body with a spruce soundboard, white oak tailpiece, maple bridge, walnut fingerboard, ebony nut, nylon tied on frets and gut strings. It does not come with a bow, but a medieval style bow is available for additional cost. Another bowed vihuela, this one has modern nylon viola da gamba strings. It has a solid poplar body with a spruce soundboard, walnut tailpiece, maple bridge, curly maple fingerboard and a boxwood nut. It does not come with a bow, but a medieval style bow is available at additional cost. Available for immediate shipping. 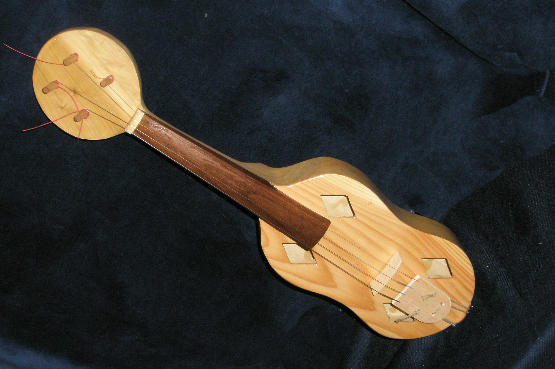 Based on a number of different 12th C examples, this flat bridge viol has a solid poplar body with a spruce soundboard, walnut tailpiece, maple bridge, cherry fingerboard, boxwood nut and modern violin stings. It comes with a modern violin bow. A medieval style bow is available for additional cost. Available for immediate shipping. Based on one of the two fiddles found on the Mary Rose, they have a solid poplar body with a spruce soundboard, cherry fingerboard, walnut or maple tailpiece, flat maple bridge, ebony nut and modern violin or viola strings. The tuning can be changed by swiching strings and lengthening or shortening the scale. It comes with a modern bow, but a bow based on the one found on the Mary Rose is available for an extra charge. The instrument on the right is available for immediate shipping. Like the instruments above except that it has a raised fingerboard and a curved bridge. This will be more comfortable to modern players and it also has a solid poplar body with a spruce soundboard with a soundpost, black walnut tailpiece, maple bridge, walnut fingerboard, boxwood nut and modern viola strings. It is set with a 16″ scale length and comes with a modern bow. A bow based on the one found with the Mary Rose is available at additional cost. Available for immediate shipping. This 15th C fiddle has excellent resonance and volume. It has a solid poplar body with a spruce soundboard, walnut fingerboard, white oak tailpiece, maple bridge, Boxwood nut and modern viola strings. It comes with a modern bow but a medieval bow is available for extra cost. Available for immediate shipping. 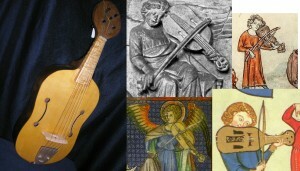 Three small rebecs based on the Cantigas de Santa Maria from the 13th Century. These instruments have a solid poplar body with a spruce soundboard, walnut fingerboard, white oak tailpiece, maple bridge, boxwood nut and 4/4 modern violin strings. They are tuned either GDg or DAd. Comes with a modern bow, though a medieval style bow is available at additional cost. Available for immediate shipping. Only one left at present. 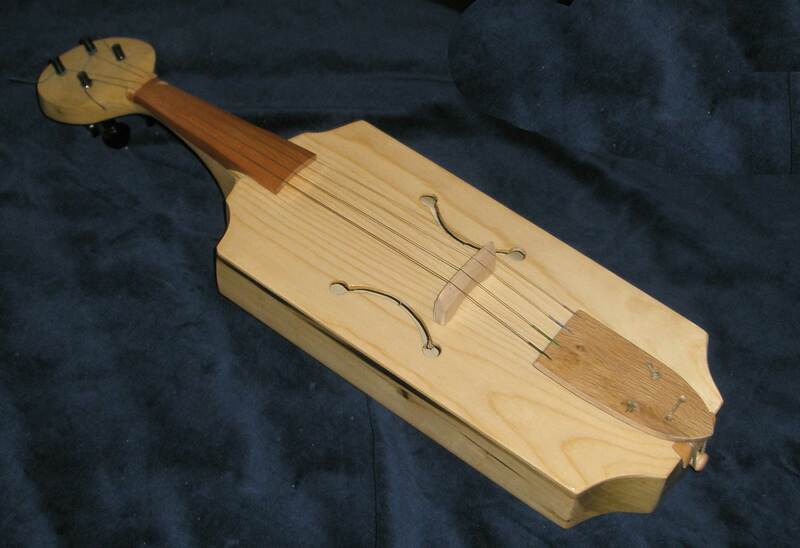 Based on instruments from the 11th through the 14th C, this rebec has good resonance without being really loud. It has a solid poplar body with a spruce soundboard, white oak tailpiece, maple bridge, walnut fingerboard, boxwood nut, and modern violin strings. It comes with a modern bow. 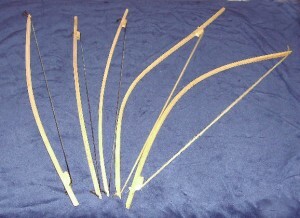 A medieval style bow is available at additional cost. The one on the left is available for immediate shipping. 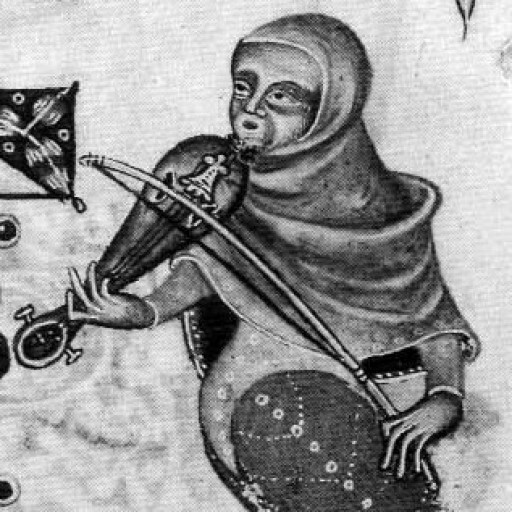 This fiddle is based on 13th and 14th C examples, though the most famous is probably the 13th C Manesse Codex. This fiddle has a solid poplar body with a spruce soundboard, walnut fingerboard, white oak tailpiece, maple bridge, boxwood nut and modern violin strings. Comes with a modern bow, though a medieval style bow is available at additional cost. Available for immediate shipping. Pictured is a selection of bows that we make for our instruments. They are usually made of white oak and except for the two pictured here, they all have black horse hair. There is some variance in size, but they tend to be in the same range as a 4/4 violin bow. They are not intended to be unstrung when not in use. Available for immediate shipping. 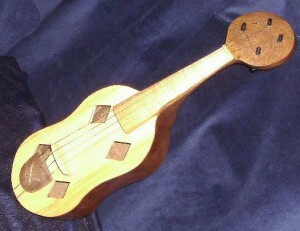 Based on a stained glass window in the 15th C cathedral in Norfolk, this is a 5 string viol. It is set up to play pairs of strings. It has a solid poplar body with a spruce soundboard, walnut fingerboard, oak tailpiece, maple bridge, ebony nut and viola strings. It comes with a modern bow. A medieval style bow is available for additional cost. Available for immediate shipping. 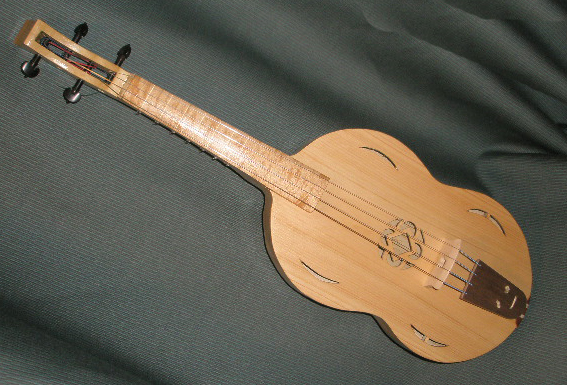 Barrel bodied fiddles based on illuminations from the 13th through the 15th Centuries. They both have solid poplar bodies with spruce soundboards, maple bridges, ebony nuts and modern violin strings. The fiddle on the left has a raised walnut fingerboard and white oak tailpiece. The fiddle on the right has a flat cherry fingerboard and walnut tailpiece. They come with a modern bow. A medieval style bow is available for additional cost. Available for immediate shipping. 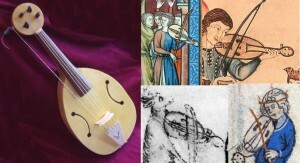 Here we have a selection of 12th to 15th C based fiddles. They have a shorter scale length. They all have a solid poplar body with a spruce sound board, boxwood nut, walnut or mahogany finger board, maple or oak bridge and tail piece. They have modern violin strings, ranging from 1/2 to 3/4. A modern bow is included. A medieval style bow is available for additional cost. Available for immediate shipping. Similar to the fiddles above, but with a much thicker solid walnut body with a spruce soundboard, maple fingerboard, tailpiece and bridge, boxwood nut and modern violin strings. It has a full sized violin scale length and comes with a modern bow. 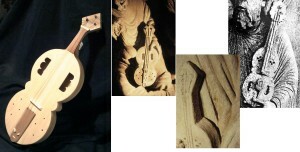 The one on the left has a raised curved bridge, the one on the left has a flat bridge common on medieval bowed instruments. A medieval style bow is available for additional cost. The fiddle on the right is available for immediate shipping. Based on a 15th C Italian woodcut. This fretted fiddle has a solid poplar body with a spruce sound board, walnut finger board, a flat maple bridge, oak tail piece, rosewood pegs, boxwood nut and violin strings. It comes with a modern bow, a medieval style bow is available for additional cost. Shown here with a 14th C rebec from Novgorad and a c.1400 rebec from Poland, these rebecs have a solid poplar body with a spruce soundboard, ebony and boxwood nut a flat maple bridge, oak tailpiece and violin strings. They come with a modern bow. 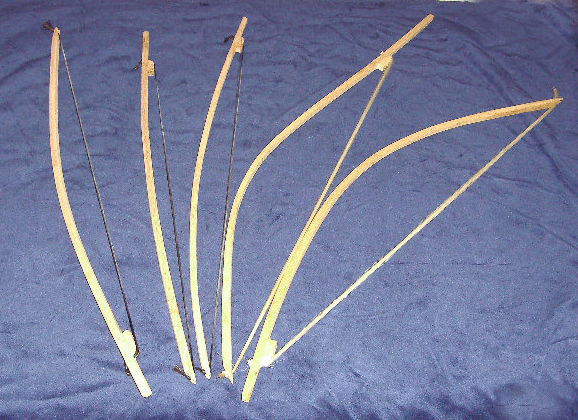 A medieval style bow is available at additional cost. Based on a musician on the 12th C St Marie cathedral, this is a common form of viol for the era. It has a solid poplar body with a spruced soundboard, white oak tailpiece, maple bridge, mahogany fingerboard, boxwood nut and modern viola strings. It comes with a modern bow. A medieval bow is available at additional cost. Based on a musician from the 12th C Eglise de San Foy Morales, this instrument has a solid poplar body with a spruce soundboard, white oak tailpiece, maple bridge, cherry fingerboard, boxwood nut and modern violin strings. It comes with a modern bow. A medieval bow is available at additional cost.